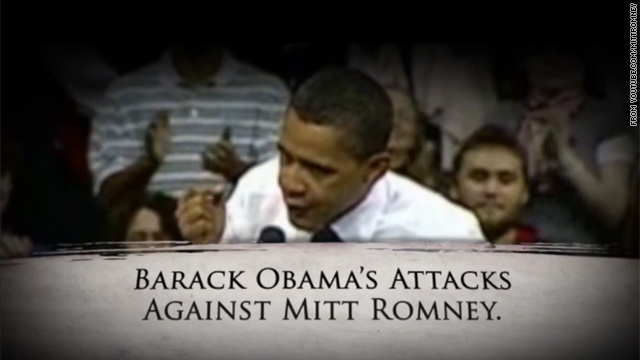 A screen grab of one of Mitt Romey's campaign ads. "I'd rather ________ than watch another campaign ad." It's hard to believe that there's still more than three months to go before the presidential election - and it's already turned into a knife fight. The airwaves are flooded with negative campaign ads. They come at us from both sides and are loud, obnoxious, boorish, and increasingly lack anything resembling dignity. And most of them are irrelevant. Coming from President Obama and the Democrats, they take aim at things like Mitt Romney's old tax returns and his time at the head of Bain Capital more than a decade ago. As for Romney and the Republicans - their attack ads focus on Obamacare, the disappearance of "hope and change" and the economy and jobs, which at least resonates with many people. One Obama ad features Romney singing "America the Beautiful" off-key while a Romney ad includes the president singing "I'm so in love with you." Childish. The sad thing is these ads don't address our real problems, like the $16 trillion national debt or the rapidly approaching fiscal cliff. Instead they just fill our airwaves, TV screens and computers with noise. When asked about negative ads, President Obama told CBS News that he's done "a whole slew of positive ads" talking about education, the tax code and how to rebuild America and promote energy development - but that they're not getting news coverage. Probably true, but without negative ads maybe the media would pay more attention to the positive stuff. Just a thought. We recently reported in the Cafferty File that negative ads have skyrocketed since the 2008 race, partially due to the growing involvement of special interest groups like Super Pacs. And unfortunately for all of us there's no end in sight. Here’s my question to you: "I'd rather ________ than watch another campaign ad." (L-R) Angela Rockwood, Tiphany Adams, Mia Schaikewitz, and Auti Angel of Sundance Channel's "Push Girls." What's the outer limit of reality TV? (CNN) - Reality TV is set to conquer the final frontier - or try. A Dutch company says it's planning a reality show about a group of humans colonizing Mars in 2023. The mission is backed by a co-creator of the show "Big Brother" as well as a Nobel-winning physicist. The company is billing it as the "biggest media event ever.” They say viewers will follow the selection and training of the colonists and ultimately their settlement on Mars. It's the next logical step, I suppose, in the phenomenon of reality TV. After all, they've already done about everything else, haven't they? Just this week, the Sundance Channel launched "Push Girls." It follows the stories of five women in wheelchairs and shows what life is like after paralysis. Reality TV took off in the 1990s with "The Real World" on MTV. Producers got a group of strangers to live together in a house and just let the cameras roll. Soon a whole industry was born. Now there are competition shows such as "Survivor," "The Apprentice" and "The Amazing Race." And we can check out talent shows such as "American Idol," "Dancing With the Stars" and "America's Got Talent" ... and dating shows such as "The Bachelor" and "The Bachelorette." There are shows about pregnant teenagers, about families with eight kids ... and with 19 kids, "Real" housewives of various locales, the Jersey Shore, weight loss shows, programs about over-the-top sweet 16 parties as well as pseudo-celebrities such as Paris Hilton and the Kardashians. From “Survivor” to women in wheelchairs to what next? Reality shows are cheap to produce and viewers like them. They're television's answer to a prayer. Here’s my question to you: What's the outer limit of reality TV?